The 2009 election for Mayor of New York City took place on Tuesday, November 3. The incumbent Mayor, Michael Bloomberg, an independent who left the Republican Party in 2008, won reelection on the Republican and Independence Party/Jobs & Education lines with 50.7% of the vote over the retiring City Comptroller, Bill Thompson, a Democrat (also endorsed by the Working Families Party), who won 46.3%. Thompson had won the Democratic primary election on September 15 with 71% of the vote over City Councilman Tony Avella and Roland Rogers. This was the fifth straight mayoral victory by Republican candidates in New York despite the city's strongly Democratic leaning in national and state elections. Six other parties' candidates also contested the general election in November. Stephen Christopher of the Conservative Party of New York won 1.6% of the votes, more than the combined total of all the other minor candidates. The turnout of voters—fewer than 350,000 in September and fewer than 1.2 million in November—was relatively low for recent mayoral elections, and Bloomberg won with fewer votes than any successful mayoral candidate had received since women joined the city's electorate in 1917. Prior to the election, the New York City Council had voted to extend the city's term limits, permitting Bloomberg (previously elected in 2001 and 2005) and other second-term officeholders such as Thompson to run for a third term. Attempts to put this decision to a popular referendum, to reverse it in the federal courts or to override it with state legislation were unsuccessful. 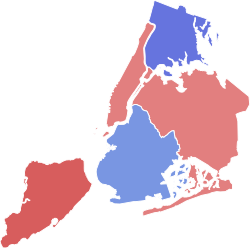 New York City elected its Mayor by popular vote when Greater New York was formed in 1897, then in 1901, 1903, 1905 and every four years thereafter, as well as in the special elections of 1930 and 1950. Michael Bloomberg, formerly a Democrat, was elected as a Republican in 2001 and 2005, succeeding another Republican mayor, Rudolph Giuliani, elected in 1993 and 1997. Bloomberg left the Republican Party in 2008 and became a political independent. By a hotly contested vote of 29–22 on October 23, 2008, the New York City Council extended the former two-term limit for Mayor, Council and other elected city offices to three terms, allowing Mayor Bloomberg to pursue his announced intention of seeking a third term in 2009. Legal challenges to the extension failed in Federal court, and a proposed law in the New York State Legislature to override the extension was not passed. Bloomberg's most prominent opponent was Bill Thompson, who could (similarly) have run for a third term as New York City Comptroller in 2009, but instead sought and won the Democratic nomination for Mayor. William C. Thompson, New York City Comptroller from January 2002 to December 2009. Bill Thompson was also the candidate of the Working Families Party. The Working Families Party's candidate for mayor was the City Comptroller and Democratic nominee, William C. Thompson Jr. Although changing his party affiliation from Republican to Independent in 2007, Bloomberg decided to run again as a Republican and was uncontested in the primary. Incumbent Mayor Michael Bloomberg, a political independent who was the endorsed Independence Party candidate, as well as the successful Republican primary nominee and an unsuccessful seeker of the Working Families Party nomination. Since he belonged to no political party, Bloomberg used the nominal label of "independent–Jobs & Education", which was merged with the Independence Party's line on the general election ballot to read "Independence/Jobs & Education". Stephen Christopher, a pastor at Memorial Baptist Church in Park Slope, Brooklyn, was unopposed for the nomination of the Conservative Party of New York. Reverend Billy Talen – announced his mayoral candidacy under the Green Party banner in Union Square on March 1, 2009. Joseph Dobrian – 2005 Libertarian candidate for Manhattan Borough President, journalist and TV talk show host. Tyrrell Eiland, an architect by training who builds green charter schools and founded the New Voice Party. Eiland also sought the nomination of the Independence Party. Frances Villar – mother, student at Lehman College, activist on domestic and international issues. Jimmy McMillan – war veteran and party candidate for Mayor in 2005, when he won 4,111 votes (0.3% of the total); also registered for the 2009 Democratic mayoral primary ballot. Dan Fein – 2005 candidate for New York City Comptroller. Jonny Porkpie, the "Burlesque Mayor of NYC". Announced his candidacy on August 3, 2009, targeting "The Naked Cowboy" as his main opponent. John M. Finan, Chief Executive Officer, New York City Consulting Group LLC, and a candidate for the Libertarian Party's 2008 nomination for U.S. President. Jimmy McMillan, also the candidate of the Rent Is Too Damn High Party in both 2005 and 2009. McMillan received 23 write-in votes in the 2009 Democratic mayoral primary. Anthony Weiner, U.S. Representative, had announced that he was a candidate for mayor, but withdrew his candidacy on May 28, 2009 and endorsed Bill Thompson. Tyrrell L. Eiland, non-profit executive, green architectural designer, and author Eiland then ran as the candidate of the New Voice Party. Bloomberg was unopposed for the Republican and Independence Party nominations (which he had also won in 2001 and 2005), Thompson was unopposed for the Working Families Party nomination, and Stephen Christopher was unopposed for the Conservative Party nomination. City Comptroller Bill Thompson and Councilman Tony Avella held their first televised debate on Wednesday, August 26, at the New York Public Library. They both directed more fire at Mayor Bloomberg than at each other. "After eight years of a Republican mayor who is focused on developers and the wealthy, I think New Yorkers are looking for change," said Thompson, while Avella declared that the "arrogance of billionaire Mike Bloomberg to think he's so important that he can overturn the term limits law, I think, is disgraceful." Another debate was held on September 9. Tony Avella, member of the New York City Council, representing a district in Queens. Out of the nearly 400 write-in votes, almost half or 184 (representing about one Democratic voter in 2,000) were some form or spelling of Mayor Michael Bloomberg. The Mayor has ruled us well, but he has infantilized us. We are a little too much like Romans of Crassus' day, when the institutions of the old republic were giving way to a despotic (and competent) imperium.... If Bloomberg had been satisfied with two terms, he would be leaving office a beloved legend, a municipal god. He'll get his third, but we'll give it to him sullenly... The Pax Bloombergiana will endure a while longer. But then what? Will we have forgotten how to govern ourselves? The first table shows Bloomberg's approval ratings since June 2009. The other table shows whether or not people want a new mayor. City Councilman Tony Avella (who lost the Democratic mayoral primary), 13; and former Mayor Rudolph Giuliani (Republican), 11. ^ a b Fernanda Santos: The Future of Term Limits Is in Court, The New York Times, New York edition, October 24, 2008, page A24 (retrieved on October 24, 2008), Judge Rejects Suit Over Term Limits, The New York Times, New York edition, January 14, 2009, page A26, and Appeals Court Upholds Term Limits Revision, The New York Times City Room Blog, April 28, 2009 (both retrieved on July 6, 2009). The original January decision by Judge Charles Sifton of the United States District Court for the Eastern District of New York (Long Island, Brooklyn, Queens and Staten Island) was upheld by a three-judge panel of the United States Court of Appeals for the Second Circuit (Vermont, Connecticut and New York state). ^ "New York - Working Families". Working Families. Retrieved 2016-10-06. ^ "Bloomberg will run as Republican in bid for third term". Daily News. New York. April 11, 2009. ^ Santos, Fernanda (April 5, 2009). "Bloomberg Is Endorsed by Independence Party". The New York Times. ISSN 0362-4331. Retrieved 2016-10-06. ^ "Our Campaigns - NYC Mayor - LBT Convention Race - Apr 09, 2013". www.ourcampaigns.com. Retrieved 2016-10-06. ^ "McMillan 09". Archived from the original on 3 May 2008. ^ a b c Board of Elections in the City of New York 2005 General Election official results Archived 2009-11-22 at the Wayback Machine. ^ "Our Campaigns - Candidate - Daniel B. Fein". www.ourcampaigns.com. Retrieved 2016-10-06. ^ "The Militant - March 9, 2009 -- SWP mayoral candidate: 'Oppose New York cuts'". www.themilitant.com. Retrieved 2016-10-06. ^ Jonny Porkpie Lives in Mary Carey's Shadow. New York Press (August 6, 2009). ^ "Index of /". www.johnmfinan.com. Retrieved 2016-10-06. ^ "mayorblakeman2009.com". www.mayorblakeman2009.com. Retrieved 2016-10-06. ^ Stop Parsing Parsons: I’m No Mayor, Let Bloomberg keep the job! ^ "Westchester Native Tyrrell Eiland Makes Run for NYC Mayor" (PDF). The Westchester Crusader. February 20, 2009. Archived from the original (PDF) on 24 March 2009. ^ "Naked Cowboy" Wants To Be Mayor of New York City. Associated Press (July 21, 2009). ^ Barbaro, Michael (2009-09-10). "In Mayoral Debate, Heated Words (and Some Gaffes)". The New York Times. p. A38. Retrieved September 16, 2009. ^ "For Mayor of New York City". New York Times. Editorial (NYC, NY). 23 October 2009. ^ Katz, Celeste. "Thompson 2; Bloomberg, 24". New York Daily News. (NYC, NY). 3 September 2009. ^ Hertzberg, Hendrik. "Biggus Buckus". The New Yorker. (NYC, NY). 9 November 2009.